SEAT's worldwide sales continue to grow with the brand posting it's best January results since 2003. They delivered 32,300 cars in the first month of 2017, a 16.5% increase over the same period last year. "2017 promises to be the most exciting year in our history, with January already off to a record breaking start, thanks to our award-winning model range proving a real hit with customers," said Richard Harrison, SEAT UK Director. SEAT is a member of the Volkswagen Group, with its headquarters in based in Martorell, Barcelona where it designs, develops, manufactures its vehicles. The updated Leon, which became available in January, is the best-selling model in the SEAT range. 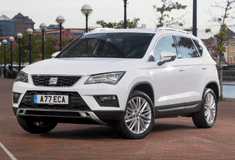 In 2016 SEAT launched its new SUV the Ateca, and 2017 will see the company's fifth-generation Ibiza reaching dealers in the summer and the launch of the Arona in the second half of the year. "We began the year with solid growth in all our major markets at a rate which is ahead of the sector average," said Wayne Griffiths, SEAT Vice-President for Sales and Marketing. "The Ateca is enabling us to reach new customers, while Leon demand has grown due to launch of the updated version." The sales increase is particularly notable in SEAT's main markets, including the UK. Here, 3,854 vehicles registered in January, an increase of 24%. In 2016, SEAT's achieved worldwide sales of 410,200 units, the highest result since 2007.